The PERFECT gift for your child or loved one! 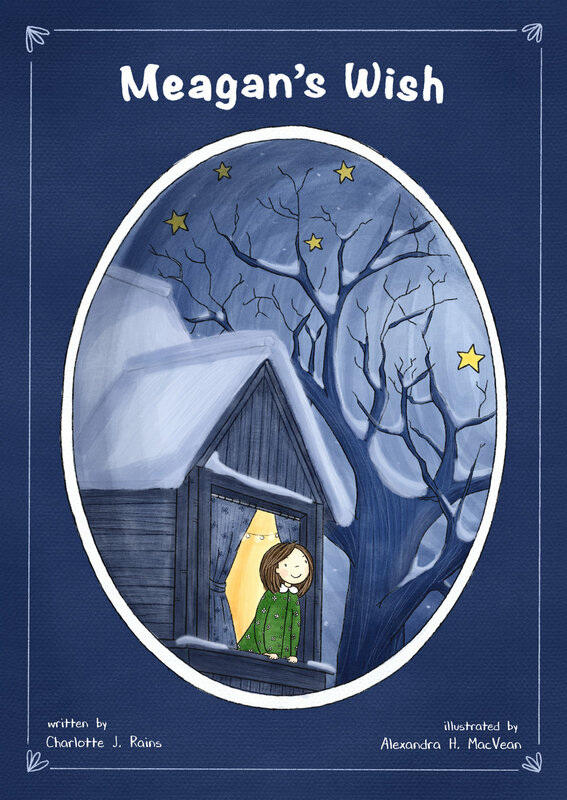 "Meagan's Wish"....a beautifully illustrated story of a little girl and her dreams coming true! Meagan is an only child, and sometimes feels very lonely. One night just before going to bed, she decides to make a wish. She had been told if she wished on a star and all the stars twinkled, her wish would come true. So Meagan searches out the biggest, shiniest star, believes with all her heart...and makes her wish! What will Meagan wish for? Will her wish really come true? Find out in “Meagan’s Wish.” A fun and heartwarming story of a lonely little girl with a secret wish.Charlotte is joining forces with her illustrator, Alexandra H. MacVean, to create another magical children's book. Stay tuned for more! * 2017 SILVER Feathered Quill Book Award in "Illustrated/Poetry". * 2017 National Indie Excellence Finalist for Best Children's Book Cover. From the new and upcoming children's author, Charlotte J. Rains, "Ladybug! Ladybug!" is a beautifully written children's poetry book filled with delightful and charming poems about well - ladybugs! They dance, they sing, and even play games with their new-found friends. These fun little creatures are sure to rhyme their way right into your child's heart! Each poem is accompanied by darling, whimsical watercolor illustrations by award-winning illustrator, Alexandra H MacVean, that are sure to bring a smile to every child's face. Keep an eye out for more books of this darling children's poetry series titled, Flitter Flutter Crawly. Chance is a little man with big dreams in the 4th and final book of his “The Mis-Adventure of Chance” series. In “Little Man’s Big Dream,” he will take your child on the ride of a lifetime! If your child enjoys adventure, you will definitely want to complete the series with this fun and colorful book. Chance is a playful little boy, the sweetest and loving little munchkin that every parent could wish for. He will be 3 years old in July. Just like any toddler, Chance is no exception. He has his moments of tantrums too. However, it's just so easy to pacify him. Playing in the park with his pet friends Tako, Markus, and Maximus, on a beautiful sunny day, is one of his favorite past time. He can easily make new friends too! In his new book, "The Mis-Adventures of Chance: A Day At The Park" you will know what I mean! Who is CHANCE? He came into our lives on a bright summer day. He didn't come by way of a hospital. And he wasn't dropped on our doorstep by a stork. No! He was flown in on a huge airplane! Since he arrived, he has touched the lives of both young and old. He is called "Sweet Little Man, Little Scamp, and the Little Rascal." But his name is CHANCE. Learn more about him in his upcoming book series, The Mis-Adventures of Chance. Special Delivery Home at Last is the first book to the Mis-Adventures of Chance series, telling all about how Chance was adopted and came to live with his new Mommy, Emma. He has a big sister, Marie, an Uncle Fred and Aunt Charlotte. What makes Chance even more special is that he came via an airplane instead of a hospital. Join Chance on his new adventures in his new home! In "Reflections," you will not only find some of Charlotte's older favorites, such as, "Roses and Thorns" and "Skylark," she's also added several new poems and older narrative poems never published until now. Charlotte's ability to bring every day life situations/thoughts from her heart-to-pen is incredible and something treasured by many across the world! Memories - we all have them, whether they be good or bad, happy or sad; they are there living in our hearts. Within the pages of this book, Charlotte's hope is that her readers will find comfort in drifting back to a place called, Home. Fathers, mothers, sisters and brothers…they all live right here inside this book. But let's not forget Grandma and Grandpa! Yes, they live right around the corner. All you have to do is turn the page and you're there. Love. What a beautiful word! Many will ride the roller coaster of love in their lifetime and some may be just fortunate enough to find it but once and hold on. However, beauty oftentimes comes with a price. When we pick a rose, we must be careful of the thorns.